Invited talk. 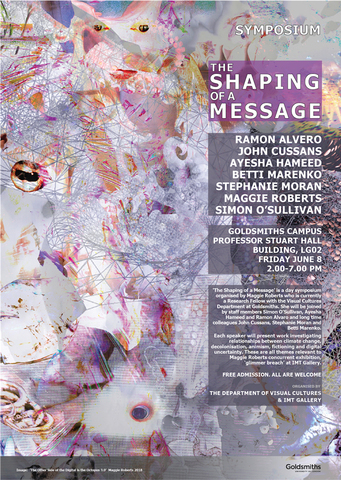 ‘The Shaping of a Message’ is a day symposium organised by Maggie Roberts who is currently a Research Fellow with the Visual Cultures Department at Goldsmiths. She will be joined by staff members Simon O’Sullivan, Ayesha Hameed and Ramon Amaro and long time colleagues John Cussans, Stephanie Moran and Betti Marenko. Each speaker will present work investigating relationships between climate change, decolonisation, animism, fictioning and digital uncertainty.